Education should be joyful, hopeful and liberating. We want to build an education system that frees minds, inspires hope and leads learners to question, criticise and create throughout their entire lives. 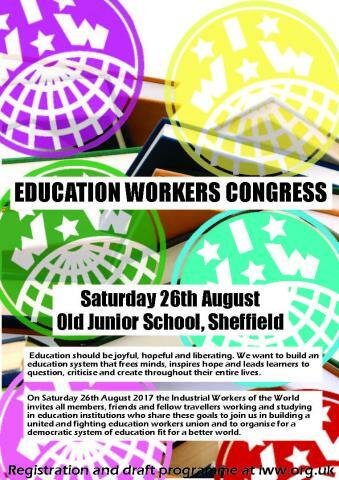 This congress is open to all members, friends and fellow travellers working and studying in education institutions who share these goals to join us in building a united and fighting education workers union and to organise for a democratic system of education fit for a better world. Over the past decade, we’ve seen conditions worsen for education workers and students as a result of austerity and crisis. Privatisation and a growth in academies has led to education workers feeling increasingly demoralised and precarious. Around half of all teachers are planning to leave their jobs in the next 5 years. Support staff have seen lower wages, increased work and temporary or fixed term contracts replace previously secure jobs. An increase in tuition fees and the increasing marketisation of education have led to students being seen more as customers interested in purchasing the best value product than as learners seeking education for its inherent value. We’ve also seen promising steps forwards – over the last few years student and education worker campaigns in London, organised by predominately migrant women cleaners have won major victories, including an end to outsourcing in SOAS. In 2018, the NUT and ATL will merge to form NEU, moving closer to one union for all education workers. Students have led campaigns for free education and against rent increases, as well as in support of education workers struggles. Internationally, we’ve seen militant education workers union struggles in Chicago and Mexico, and student struggles in Quebec. This congress offers us the chance to develop a vision of education under community and worker control. Together we can develop resources to support education workers, mentally and emotionally. We can build local education workers union branches, which can simultaneously be a place to campaign for a better education system and society, support ourselves and our fellow workers, intervene in trade union disputes, and unite workers across different trade unions to build a fighting union for all education workers. 1. Discuss, debate and reach a consensus on our agreed criticisms of the existing education system and our vision of a left-libertarian alternative. 2. Share and recommend best practice for education worker groups based on the successes of past experiences and campaigns and agree priority campaign areas for future organising. 3. Commission a core of education worker organisers to build education worker groups in their workplaces and locales with agreed goals. 4. Outline the resources needed for education workers facing stress from work pressures, atomisation, privatisation and casualisation across the sector. 5. Outline an agreed strategy for “dual-carding” Reps in TUC trade unions. Purpose: to analyse the problems with the current education system and present a vision for education controlled by and for the benefit of the workers, the community and the students themselves. Within the current context particular attention needs to be given to the way in which the state is using educational institutions as an area for the enforcement of border-policing, racist and Islamophobic policies and how educators can support migrant learners and their families. To present this vision as a statement by the congress. 1.) Creating resources for education workers facing stress from work pressures, atomisation, privatisation and casualisation across the sector. 1.) How do we operate within existing TUC trade unions? 2.) What should be the priority areas for IWW Education campaigns? 3.) Building a new world in the shell of the old: is it possible to bring our ideal vision of education into current practice? 15 minute report back and discussion. 20 minute implementation, including commissioning a core of education worker organisers to build education worker groups. 4pm – 4:30pm Coffee / Comfort Break. We welcome guest speakers Luis from the SOAS Justice for Cleaners Campaign and researcher Alex Mason to discuss the frontiers for the fight for equality in our education institutions. SOAS Justice For Cleaners is led by SOAS cleaning staff, who started the campaign in 2006. In 2008 the campaign won the London Living Wage. Supported by the Students’ Union, and staff unions UNISON and UCU, the campaign for fair and equal pay and conditions has grown. Last year the campaign had a victory, winning its demands for sick pay, holiday pay and pensions, but not the full campaign demands so the fight continues! Alex Mason is a researcher at the University of Sheffield whose work focuses on institutionalised racism within the academy, decolonising the curriculum and the design of inclusive and diverse learning environments. Their presentations will be followed by a Q and A from the floor.